Are you currently dealing with oil, water, or soil based stains inside and outside your home or commercial property? If so, do not worry anymore. We have developed the TSSPRO-550 Stain Safe Sealer to combat common kitchen, shower, and outdoor cooking stains. 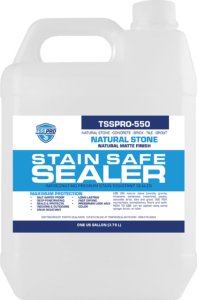 In this post, we are going to highlight the benefits of TSSPRO 550 stain safe sealer. Did you know that on unprotected stone, these common stain-producing products such as soda, oils, ketchup, and red wine soak in and leave difficult to remove stains? Which is why we have spent the time to develop a stain safe sealer to fight against all these stain-producing products. This revolutionary sealant is extremely unique and is a high performance, commercial grade, high curing sealant that is like no other on the market. In particular, this powerful sealant penetrates the surface onto which it is applied at the molecular level, bonding to the surface and forming a durable, waterproof barrier that will not weaken over time. This sealant can be used for interior, exterior, residential and commercial use. It was formulated for easy use and to give you peace of mind from common household stains. This sealant is the best of its kind because it also has one of the fastest curing processes. The TSSPRO-550 Stain Safe Sealer is fully cured after 24-48 hours. This sealant is also extremely easy to maintain. You do not want to use abrasive cleaners which may degrade the sealer. Instead, you will use a neutral cleaner. It is important to remember to not use cleaners which contain silicone agents. Contact TSS Pro Sealants Today! In short, our revolutionary sealant offers the ideal solution for any homeowner or business concerned about stains. This sealant will ensure that even the toughest and largest stains are not able to perforate the surface. We have scraped and chemically removed more poor quality sealants in the past. Which is why we found it necessary to make our brand of sealants. Because of this, we have sent the past 18 years perfecting our own sealants. As a result, making our sealants the best sealants on the market. Give us a call today at 888-958-0556. To speak to our friendly specialist and how we can help you with all sealing needs. Or visit our website at https://tssprosealants.com/. We can’t wait to provide the solutions to your sealing challenges today!